The Manchu people from north east China formed the last imperial Qing dynasty. The Manchus established a power base at Shenyang (Mukden) broadly based on those of Ming China including their own smaller version of the ‘Forbidden City’. 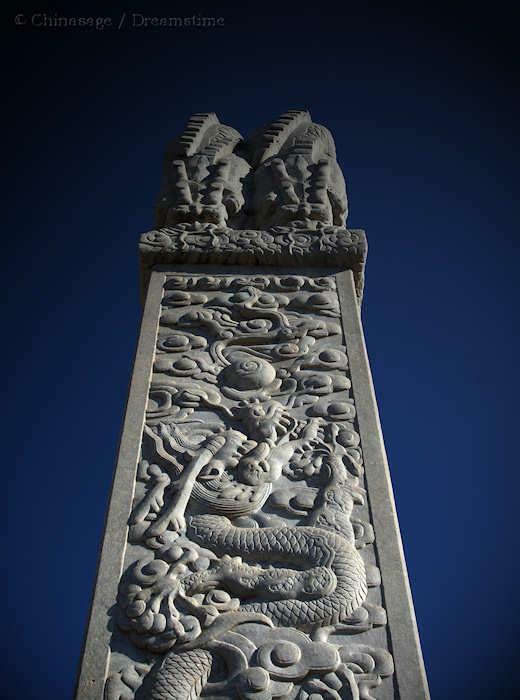 Although there was a connection to the Jurchen people who formed the Jin dynasty (1115-1234), the Manchu history was short - stretching back only to the start of the 17th century, and their population was tiny compared to the Han Chinese. After subjugating Korea and Mongolia the Manchus set their eyes on conquering China. The factors leading to the downfall of the Ming include famine; economic collapse; over population and internal rebellion rather than external attack. The huge funds that had been poured into strengthening the Great Wall proved in the end futile as you can read in our full description. The Manchu cause was greatly strengthened when Ming generals and their north-eastern armies joined them. The Manchus were invited into China to help quell the rebellion of Li Zicheng in 1644 and following the pattern of previous ill-fated alliances the Manchus seized power rather than leaving after Li's defeat. For the first ten years of Manchu rule they only controlled northern China, south of the Yangzi there remained Ming Chinese ruled territory with only nodding acquiescence to the new northern regime. A revolt in the south by Wu Sangui ➚ to re-establish Chinese rule in the north began in 1673, it rumbled on for eight years before the Manchus wiped out the whole Wu family that had declared themselves Emperors of the 'Greater Zhou dynasty'. The Qing forces used brutal reprisals against the rebels, including the massacre of most of the population of Yangzhou, Jiangsu in 1645. Ming loyalist Guoxingye Koxinga WG held out against Qing conquest until 1683 from a power base in Fujian and then Taiwan. When the Manchus conquered China to form the Qing dynasty in 1644 China's territory extended well beyond the Great Wall into Manchuria. Disputes with the expansionist Russian Empire led to sieges and skirmishes along the poorly defined northern border. The Treaty of Nerchinsk with Russia in 1689 formally defined the northern border and ended the conflict. The dispute was complicated by the presence of the Mongols who were feared might unite with the Russians against China. Strangely, perhaps, the treaty was written in Latin ➚ as this was the language known to both Russia and China (the Jesuit mission in Beijing was still active at the time). The Manchus defeated the Mongol leader Galgan in 1696, bringing the whole of Mongolia into the Chinese Empire. The modern border of China and Russia still follows this line with the exception that Mongolia became a separate country in 1912 and a segment of land between the Ussuri and Amur Rivers was ceded to Russia in 1858. Nerchinsk (Не́рчинск) is located on the Shilka River (Ши́лка) just north of where the Mongolia/China and China/Russia borders meet. The treaty was important as it both opened up China to trade with Russia (a right that other European states avidly wished to procure) and for the first time acknowledged Russia as an independent nation rather than a vassal state. The map shows the full area of Qing control established in the early years of the empire, it nearly matched the vast territories of the Mongol dynasty. The green dotted area became effectively independent during late Qing times, while the brown dotted area was lost to foreign countries. Nepal and Burma were lost to Britain. Vietnam and Laos were taken into French Indo-China. As a result of two wars with Japan, China lost suzerainty over Korea and then Manchuria. Even so the population of China had doubled since the Song dynasty to an incredible 200 million by 1762. This rapidly increased to 395 million in 1830; the pressure on resources by sheer weight of numbers weakened the Qing's ability to feed it people and maintain peaceful rule. The Qing rulers in the early years kept themselves apart from the Han Chinese who served them. The Manchus were outnumbered 35:1 by the Chinese, so some degree of acquiescence was necessary. Laws were enacted prohibiting marriage between Manchu and Chinese, and the keeping of weapons by the Chinese. An efficient military 'banner' system kept rebellions in check. However Chinese administrative and tax collection systems remained much the same as in Ming China. The Christian Jesuits who had arrived at court in late Ming times continued to impress the Imperial court with their knowledge of science and in particular astronomy. The first four Qing Emperors Shunzhi; Kangxi; Yongzheng and Qianlong ruled long and skillfully, their reigns covered 150 years of relative prosperity for all in China. As foreign rulers they found it easy to reform the administration rather than sticking rigidly to ancient tradition; systems that no longer worked were abandoned. Manchus worked alongside Chinese ministers to carry out their reforms. Emperor Kangxi immersed himself in Confucian doctrine and took personal interest in the examination system to attract the brightest scholars to high office. Emperor Qianlong, however, sought to impose literary censorship in the period 1772-88 by destroying any text critical of the Manchus, in an echo of Emperor Qin Shihuangdi's actions; many important historical works were lost. International trade grew, not only with Europe but also with Japan and Russia. Portuguese and English trade in the South China Sea continued to produce friction. In 1661 a Dutch force tortured the undefended, Buddhist monks on Putao Shan, Zhejiang and then burnt the temples to the ground. The Qing responded by outlawed all trade with Europeans except through Guangzhou (then known as Canton). The defeat of Mongol leader Galdan ➚ in 1696 at the battle of Urga pacified the northern border, and enabled the subsequent conquest of Xinjiang in 1759. The annexation of Tibet helped pacify the Mongols because they had embraced Tibetan Buddhism. Use of European designed artillery proved crucial to the military superiority of Qing forces. At around 1750 China was the largest, strongest, wealthiest and most populous nation on Earth. The pivotal time in the fortunes of the Qing dynasty was about 1800, the Emperors in the later half of the century did not have the strength of leadership of their predecessors, natural disasters started to question their ‘Mandate of heaven’. The reason for the gradual degradation of their ability to rule is widely debated but population pressure must be the fundamental one. There were always so many unemployed people that prices were driven too low for factories to be able compete with handmade goods. All viable land had already been used for agriculture, there was nowhere left to plant new crops. The first of many internal rebellions was the White Lotus Rebellion (1796-1804) which was a Buddhist inspired movement to reinstate the 'native' Ming dynasty. The rebels managed to hold out in mountain retreats. It was the first demonstration that Manchu power was limited and it all proved very costly. In the late Qing dynasty over 60 million died in various rebellions. It should be remembered that at this time it was people rather than horses were still pulling the plow. Girl infanticide occurred in times of hardship as boys were stronger and were needed to carry on the family line. Women's modesty and celibacy were held up as correct behavior. The Qing dynasty turned more and more to Confucian orthodoxy and failed to understand or use the new European technology. With limited reforms China became stultified. The facade presented was truly impressive but behind it the signs of decay and decline were easy to see. The decline is evident in the artwork produced – the Ming tradition was continued where artists were meticulous copyists rather than innovators. During this time work in ivory grew in quantity through the opening of trade with Africa, and although highly skilled, the designs lacked experimentation and evolution. The inertia stemmed from the universal belief that all that was made in ancient times was naturally superior to anything modern. Export porcelain was the only exception to this malaise, here the requirements of European customers forced the makers to innovate. A major contributory factor to the successful conquest of China by the Manchus was their military system. Elite troops were attached to a hierarchical system under different colored flags (banners) . In order of seniority they were: yellow, bordered yellow, white, bordered white, red, bordered red, blue and bordered blue. The borders were red except for bordered red which had a white border. There was about 18,000 men in each banner divided into 60 companies. Companies comprised of men of the same ethnic group in seniority order: Manchu; Mongol and Han Chinese. Membership was hereditary and they received land and a salary for their service. However the bulk of the Chinese Army was made up of less well trained troops under the name 'green standard army ➚'. Hatred of 'foreign' Manchu rule led to many rebellions. The Qing response to weakening control was to make the laws more conservative with harsher penalties. All Chinese men were forced to shave the top and sides of the head and plait their hair from three braids into a queue ➚ 辫子 biànzi dangling from the back of their heads, a continuous reminder of the rule by Manchu foreigners. Initially the queue had been used to quickly distinguish between those who had surrendered and those who still resisted Manchu rule. The queue was in some respects a practical hairstyle as it kept unruly hair out of the eyes. It could be coiled on the top of the head beneath a cap or coiled around the neck. As part of joining the fad for Chinoiserie some Westerners adopted the ‘pigtail’- including George Washington and King George III. It became a traditional fashion worn by some with pride and some even re-grew the queue in the Republican period. The Taipings in their rebellion (1850-1864) cut off their queues which was motivated by anger against 'foreign' rule. It was the largest and most bloody Civil War in human history (see our section on the rebellion for more on this). In foreign disputes the Qing Empire had no response to the advanced British Navy that wished to open up China to trade. The silver used by the Chinese to purchase opium led to a huge drain on Imperial finances. Growing tensions led to the Opium Wars which resulted in an erosion of China's economic and military power. With a justifiable suspicion of foreign sea traders and also of the Han Chinese people of the Yangzi basin, the Manchu rulers wanted full control of foreign trade in tea and silk. They chose to funnel all trade through one port (Guangzhou Canton) with a ban of coastal transport of goods, all goods, including delicate porcelain had to come by tortuous overland routes to the port. This ban was widely flouted to the financial benefit of many southern Chinese. China's defeat in the Opium Wars led to the opening up for trade of a whole series of concessionary treaty ports all around China's coast and up the Yangzi River as far as Chongqing. Some districts such as Qingdao and Hong Kong were under direct foreign ownership. Many Chinese chose to escape poverty and famine by moving abroad, taking up the many new opportunities opening up in Singapore, Malaysia, Borneo, South America and the United States. The interest in China was to a limited extent reflected the other way; the first Chinese Ambassador to the UK Guo Songtao ➚ reported positively about civilization in Europe, in fact to such an extent that his widely read diaries were banned for a while in China. Wang Tao ➚ went further, praising the English political and economic system above that of China, saying only the legendary Golden Age in China surpassed it. In 1861 China was more or less forced to set up a 'Foreign Office' to deal with all aspects of diplomacy and foreign aggression. She had resisted this move for centuries because it made the standing of other nations 'almost' equal, contrary to the traditional view of barbarian tribes surrounding the one true civilized nation. In Chinese it was the 总理各国事务衙门 Zǒng lǐ gè guó shì wù yá men abbreviated to Zongli yamen. Although it was supposed to direct the Emperor in foreign policy, it was strong regional leaders such as Li Hongzhang that had the most influential voice. As well as the Taiping rebellion and Opium Wars just as deadly a revolt occurred in the ‘Panthay Rebellion ➚’ when Muslims rose up in 1856. 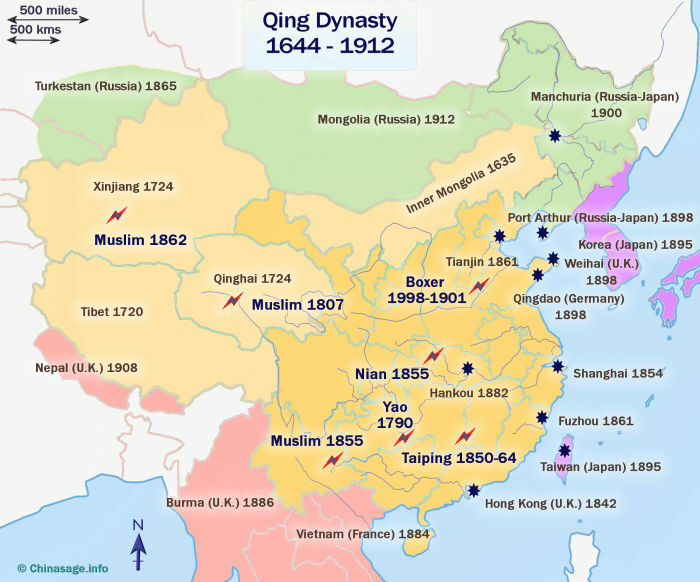 The trigger point was in distant Yunnan but revolts also occurred in Muslim dominated north-western China. Millions of Muslims died in the revolt which was savagely suppressed. The key figure in China at the end of the Qing dynasty was Dowager Empress Cixi who controlled a succession of young, weak emperors so that she remained the effective ruler. Ancient tradition forbade the succession to go up a generation (and so allow uncles to take power) so the death of an infant emperor severely limited options to cousins and nephews. 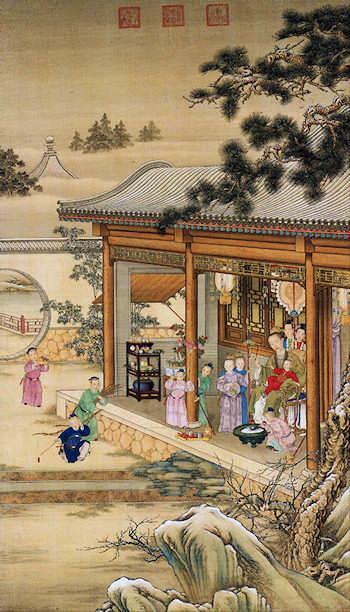 The Confucian tradition placed the wishes of parents above oneself, and in this way the infant Emperors had to defer absolutely to the views of Cixi. In the 1860s the Self-Strengthening Movement sought reform to revitalize Qing rule. It aimed to bring in knowledge of Western science and technology. Li Hongzhang was one of the leading reformers. However, Cixi resisted these reforms and backed the Boxer Rebels (see later section) against the foreigners. This Rebellion and other disastrous disputes with Russia, Japan and European Powers led to the collapse of the empire and the foundation of the Republic of China in 1911. Nothing in Chinese history is straightforward. For although the Republic was founded in 1911 the Emperor remained with all his titles within the Forbidden City. He just abdicated his right to rule the people, he continued to carry out Imperial duties under the 'Articles of Favorable Treatment ➚'. The President of the Republic occupied the area to the west of the Forbidden City, a site that it occupies up to the present day. So Emperor and President co-existed side-by-side in this strange arrangement. This state of affairs was necessary because the vast majority of the ordinary Chinese people still believed in the Imperial system not a Republic, by just taking away the right to the govern the institution of Son of Heaven was maintained. The last flicker of Qing rule was the installation of Puyi as a puppet Emperor (1932-45) during the Japanese occupation of Manchuria. The Qing dynasty's disarray is most clearly evident in the hundred days that sought to radically reform China. Leading officials such as Li Hongzhang had seen the superiority of European technology; warfare and industry at first hand and they strove to influence the young Emperor Guangxu. The leading intellectual Kang Youwei believed he had the answer, a system of reforms ➚ that could be seen to harmonize with Confucian philosophy ('Chinese learning for basic principles; Western learning for practical application'). He struggled to be granted an audience with the Emperor, but when he did the reforms were imposed rapidly in June to September 1898. The ancient examination system was reformed; the University in Beijing and modern technology schools were founded; commerce and engineering were promoted. However, conservatives at court were threatened by the reforms and soon it became a power-play between Emperor Guangxu and Dowager Empress Cixi. A plot to remove the Empress with the support of army leader Yuan Shikai backfired, many leading reformers were executed or fled into exile and the Emperor himself was stripped of power and incarcerated within the Summer Palace. The last opportunity for a major reform of the dynastic system was lost. The Boxer Rebellion 1898-1901 exemplifies the complexities of late Qing dynasty times. Although the Manchu rulers were seen as foreigners by Han Chinese, an explosion of 'anti-foreigner' sentiment spread through China at times directed as much against Manchus as against Europeans. In Southern China the foreigners had not been forgiven for siding with their Manchu overlords in the Taiping Rebellion. The origin was in an anti-Manchu movement the White Lotus sect ➚ which had Buddhist connections. The Boxers, known as Yi he tuan 义和拳 in China ‘Righteous and Harmonious Fists’ believed that their martial arts were proof even against bullets (they followed the Daoist 'Wushu' technique). An earlier uprising in the 18th century had been suppressed by the Qing, but in 1898 the Boxers arose again in Shandong and Hebei. Heavy taxation and unemployment due to a flood of cheap foreign imports brought mass support from among ordinary people. They followed the tradition of grassroots rebellions against a failing dynasty that had lost its Mandate of Heaven. Shandong in particular suffered from rapid industrial development by foreign powers without regard for the local people and their customs. The Boxers first targeted Christian missionaries and their converts (often 'rice bowl Christians', lured to baptism in order to escape famine). The Boxers were given semi-legal status by the Governor of Shandong when he was unable to quell the revolt, but deflected their anti-Qing sentiments towards the foreigners. Outlandish rumors had developed about the devilish foreign missionaries. The missionaries sought out dying babies so they could at least be baptized before death; locals assumed that the babies were wanted for body parts, particularly the eyes. The singing at mission services gave credence to belief that wild orgies were taking place. It was alleged that the missions were deliberately spreading smallpox and that people were hypnotized into converting to Christianity. With all these wild tales and half-truths it was easy to stir up hatred. In all about 180 missionaries and 32,000 converted Chinese Christians were slaughtered by the Boxers . General Yuan Shikai was sent by Beijing to suppress them, and peace was restored in Shandong; but soon the rebellion spread into Hebei nearer to the capital Beijing, where once again the foreign missionaries bore the brunt. The storm then hit the foreign legation quarter in Beijing. This was a small area close to the Forbidden City held the embassies of nine foreign powers (Britain, America, Germany, France, Italy, Austro-Hungary, Russia, Japan and Italy) and was besieged for 55 days (A Hollywood film '55 days in Peking ➚'  portrays life at the time from the European perspective). The 11th June 1900 the Japanese Chancellor of the legation was murdered and on the 20th June the German foreign minister was shot dead. The Boxers also exacted revenge on any Chinese seen as collaborating with the foreigners. On June 16th 1900 a medicine shop in the hutong district of Dashilanr, Beijing was attacked. The Times of London reported: “Adjoining buildings took fire, the flames spread to the bookseller’s street and the most interesting street in China, filled with priceless scrolls, manuscripts and printed books was gutted from end to end. Fire licked up house after house, and soon the conflagration was the most disastrous ever known in China, reducing to ashes the richest part of Peking, the pearl and jewel shops, the silk and fur, the satin and embroidery stores, the great curio shops, the gold and silver shops, the melting houses and nearly all that was of the highest value in the metropolis. Irreparable was the damage done.”. Dowager Empress Cixi at first supported the Boxers, she proclaimed 'The foreigners have been aggressive towards us, infringed on our territorial integrity, trampled our people under feet... The common people suffer greatly at their hands and everyone of them is vengeful'. On June 18th 1900 she commanded the Imperial troops to join the Boxers against the foreign legations in Beijing. She issued an edict that all foreigners should be killed, two brave reformist officials (Yuan Chang and Xu Jingcheng) modified the edict from 'slay' to 'protect' but their forgery was soon detected and they were beheaded in July 1900. The legations banded together and built barricades. On June 23rd the Hanlin Academy adjoining the British embassy was set alight and only with desperate measures were the legations saved from the flames. After fierce fighting the siege was lifted by an Allied force of 1,500 (more than half the foreign troops were killed), thereupon Cixi adopting a disguise, fled north from Beijing to Xi'an. The victors looted the Forbidden City and imposed more onerous demands on China in the Allied Boxer Protocol ➚ with additional financial reparations, the Qing officials who had supported the rebellion were commanded to be executed. Russia used the uprising as an excuse to pour 200,000 troops into Manchuria. The extra-ordinary passion and fierce spirit of the Boxers (fighting with fists and knives against rifles) surprised the foreign powers who were poised to calve up China into areas of foreign control, expecting little resistance. The rebellion can therefore be seen to presage the end of Manchu rule and the resurgence of a spirit of Chinese nationalism. Manchuria is an area of north-eastern China roughly covered by the modern provinces of Liaoning, Jilin and Heilongjiang along with eastern Inner Mongolia. It is named after the homeland of the Manchu people (it is derived from the Japanese name for the area : ‘Manshu’). When China was strongest Manchuria fell under central Chinese control at other times it remained an independent kingdom stretching into Inner Mongolia. Manchuria became important when the Manchu people conquered China and formed the Qing dynasty in 1644. Manchu people formed the ruling elite of the new dynasty and Han Chinese were not allowed to settle in Manchuria or marry Manchus. The territory was marked out with a ‘Willow Palisade’ that stretched for hundreds of miles to keep people out, and it had a special form of administration up until 1907. It was originally a sparsely populated region but towards the end of the Qing and the Republic Han Chinese people settled there in large numbers, coming particularly from Shandong province, and they are now the predominate people. This policy was put in place to counterbalance increasing Russian aggression and activity in the region. Ethnic Manchus are now a small minority and their culture is under threat of being lost. After 1898 Russia had effectively annexed the area, much to the disgust of the British who saw Russia as a potential rival in East Asia, Britain then encouraged the Japanese to wrest control from the Russians and they became the dominant power 1904-5 when the Qing dynasty was falling apart. Japan introduced rapid industrialization, exploiting the rich coal and iron deposits and brought the first heavy industry into China. During the Japanese occupation former Emperor Puyi was installed as Emperor of Manchuguo. The name Manchuria (满洲 Mǎnzhōu) is not generally used in China except to refer to the period of Japanese rule. The life of the Last Emperor Puyi spans the transition from Imperial China to the People's Republic and exemplifies the turmoil of the time. After the trauma of the Taiping Rebellion and the Opium Wars it had become the norm for Dowager Empress Cixi to rule as the regent on behalf of infant Emperors since 1861. 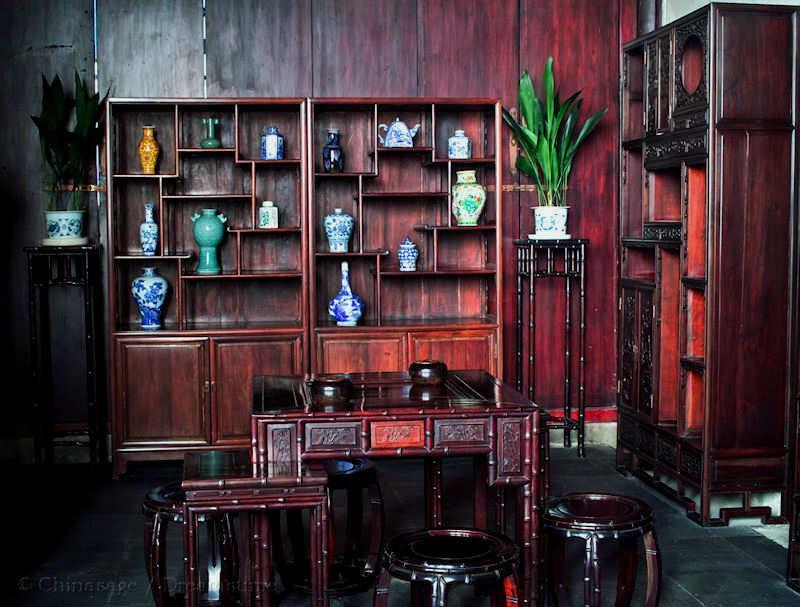 Puyi was born in 1906 as a prisoner in Imperial opulence within the Forbidden City. Dowager Empress Cixi struggled in vain to maintain control over a disunited and bankrupt nation. It was the attitude towards the foreigners that was causing the greatest trouble. Imperial support for the anti-foreigner Boxer Rebellion movement greatly weakened the position of the Imperial family. 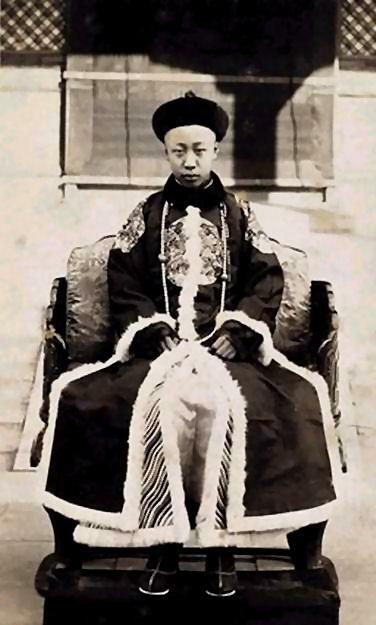 Puyi's predecessor, Emperor Guangxu, died on 14th Nov 1908 from arsenic poisoning (possibly ordered by Cixi herself). The Dowager Empress died the following day. It was these inauspicious events that saw Puyi at the age of three become the last Emperor of China with the title Xuantong (宣统). Puyi's father Zaifeng ➚ (Prince Chun) was made regent but proved an incompetent and corrupt man. Zaifeng had been passed over in the succession because of Cixi's suspicions about his pro-European sentiments (he had traveled to Europe to appease the Western powers over the Boxer Rebellion) and because he was of the same generation of Guangxu - imperial succession rules require the new emperor to be of the next generation. Emperor Puyi was only six when the Republic of China was declared in 1911 and took no part in these events, in fact he remained unaware of them. Surprisingly, his sheltered life of luxury within the thick walls of the Forbidden City was hardly affected by the change, he remained the Emperor of China in title and honor. The new Republic had a slender grasp on power, the overwhelming mass of the population had for thousands of years been ruled by an Emperor and so it was judged politically expedient to not change the situation drastically. So the Imperial Court was given extensive funds to continue life in lavish and wasteful luxury just as it had done before 1911. The only change was that the Emperor's power did not extend beyond the walls of the Forbidden Palace. It was the machinations of imperialist minded Yuan Shikai that governed his fate. Seen by the Europeans as the strong man who could unite and modernize China, Yuan Shikai acted as the effective regent for Puyi. Yuan Shikai's ambitions were, however, to found his own dynasty rather than continue as President of a Republic. When he proclaimed himself Emperor in 1915, revolts began anew and he died from kidney failure later in 1915 with the country still locked in rebellion. So in the years 1912-24 Puyi was still seen as a potential ruler of China should the fragile Republic fail. For these twelve years China had both a President and Emperor. Indeed in July 1917 General Zhang Xun at the zenith of his power had Puyi proclaimed emperor again, but only for 11 days. It seems Zhang wanted the Emperor to become an absolute ruler rather than a figurehead and this was unacceptable to most Republicans. The leading world power at this time was Britain and it was the Scotsman Reginald Johnston ➚ who became Puyi's most trusted adviser, friend and mentor. Ostensibly he was brought in as tutor in English but he acted as a spy, passing on reports to the British legation. Britain wanted an insider in the Palace if the shaky Republican grip on power should end. Britain seemed to have backed a constitutional monarchy for China, as that was the system in Britain, where the monarch is head of state but has no political power. Reginald Johnston had been governor of the British enclave at Weihaiwei, Shandong and had learned much of Chinese customs and had become a scholar of Chinese literature. He was seen by his British masters as to have become too Chinese and not entirely trusted. Johnston introduced many modernizations to the Imperial Court despite the open opposition of the Imperial eunuchs and Dowager Empresses. Telephones, bicycles, films, spectacles and western clothes were some of the many new innovations that at last made their way into the Palace. In 1924 Puyi was ejected from the Forbidden City and lost his title as Emperor when the left-wing General Feng (a.k.a. The Christian General ➚) took over Beijing. Puyi was moved to Prince Chun's Northern Mansion with a much reduced retinue and monetary allowance. Here Puyi fretted about his imprisonment; he then escaped with Johnston's help to the Japanese Legation. Japan was at the time seen as a 'modern' and 'liberal' state, many Chinese Republicans had stayed there including Sun Yatsen and the writer Lu Xun. Japan was investing heavily in modernizing Manchuria. So Puyi's move was not unpatriotic but pragmatic, with Japanese help he could hope to come back one day as Emperor of a revitalized China or at least King of Manchuria; he was after all the head of the Manchu people. It was only in the 1930s that Emperor Hirohito ➚'s plans for conquest of China and Asia became clear. Puyi was powerless to stop himself becoming the tool of the Japanese in Manchuria. He was installed as Emperor of Manchuguo ➚ (Manchuria) on 1st March 1934, a step that greatly legitimized Japan's control of the region. Puyi was imprisoned in the former Salt Tax Administration building ➚ in Changchun. He was not allowed out and the Japanese selected who was allowed to come in to see him. He put his Imperial seal on all the official papers that were put before him, he had no choice. The years were of utmost boredom, he had a small household of servants and family. He became a devout Buddhist and a vegetarian. His wife Wanrong ➚ (a.k.a. Elizabeth) took to opium and they had no children. 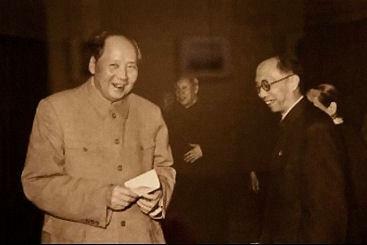 'Henry' Puyi and Mao Zedong, Autumn 1961. Image available under a Creative Commons license ➚. When the Soviets liberated Manchuria in 1945, after the dropping of the U.S. atom bombs on Japan, Puyi and a small entourage tried to flee to Japan. He was stopped by the Soviet communists at the airport. He stood trial for war crimes by the Allied powers in Japan where he claimed he was a helpless puppet who had been kidnapped by the Japanese. In 1950 he was handed over to the Chinese government. Puyi expected to be executed. The regime, however, had other plans, he would be far more useful to them if he was converted to the Communist cause. So, in the Fushun prison in Liaoning he was remolded as a Communist. After extensive sessions of self criticism Puyi took all the blame for the catastrophes that befell him including the admission that he had not been kidnapped but gone over to the Japanese voluntarily. He wrote a book of his life ➚ probably slanted to please his Communist jailers. He was released in 1959 and thereafter lived more or less as an ordinary citizen in Communist China. Once again Puyi had adapted to conditions and against the odds survived to old age. He was the embodiment of the Daoist tradition of bending with the wind and water in order to survive. Puyi seems to have accepted his fate under the People's Republic, he was allowed some special favors and worked as a part-time librarian and gardener. When at a reception in 1960 for Field Marshal Montgomery ➚ he was asked if he was happy, Pu Yi replied “I am a gardener now and I have never been happier in my life. It is much better to be a gardener than to sit on the throne of the Imperial Palace doing just what you're told to do.” Zhou Enlai intervened to save him from the excesses of the Cultural Revolution. He died in 1967 of bladder cancer at a hospital in Beijing. Puyi's half brother Puren ➚ lived in Beijing to the ripe old age of 96, dying in April 2015. The incredible story of his life is told in the award winning film The Last Emperor ➚ in 1987 by Bernardo Bertolucci ➚. A child born as the most pampered person in the World is gradually stripped, step by step of all vestiges of Imperial splendor to die alone as an ordinary person. Citation information for this page : Chinasage, 'The last Qing (Manchu) Dynasty 1644 - 1912 of China', last updated 19 Feb 2018, Web, http://www.chinasage.info/dynastyqing.htm.